The score history for this newest Marvel installment is a tricky one. With Alan Silvestri the original go-to of Marvel scores (composing both Captain America and The Avengers), the mantle was handed to Brian Tyler (who in turn composed Iron Man 3 and Thor: The Dark World). Even with other films and composers in between, these two blockbuster composers have had their work featured in the most of the Cinematic Universe. 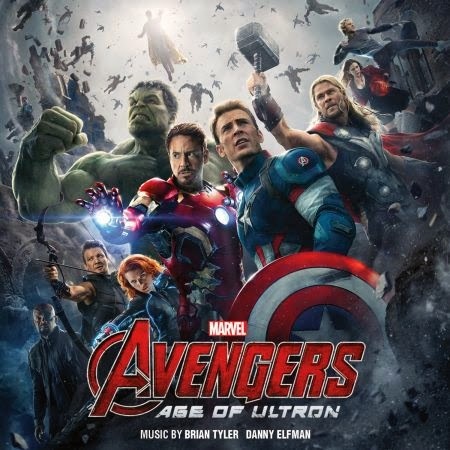 Along came Danny Elfman (with his own superhero film resume) tasked to compose an hour of music to Avengers: Age of Ultron a few months before the film's release. So now Tyler and Elfman share "music by" billing. Such last minute large replacements can be a disaster for score fans and sometimes hurt the film rather than help. The resulting album is a combination of both composer's work, almost alternating (compared to the split album like Last of the Mohicans (1992)). For convenience in the rundown below, I've color coded Tyler's tracks blue and Elfman's tracks red. The album begins with Avengers: Age Of Ultron Titles, which overlays the recent Marvel Fanfare. In the brief dark cue, we're introduced to Ultron's theme, which surfaces later in full. Heroes is where the blending of the composers begins. It mainly introduces the New Avengers theme (Elfman) with Tyler-style percussion clanging and string ostinatos while mixing in the Avengers theme (Silvestri). It's nice to hear such a big opening cue for the film and possibly more Avengers theme references than Silvestri used. Rise Together starts right off with a bombastic sound and choir with Tyler showing off his orchestral chops. Listen for the Iron Man theme (Tyler) is referenced near the end. Breaking and Entering is a strong action cue, which lets up for an interesting and mysterious theme on piano. It Begins, which starts the film, contains another Avengers theme reference and the New Avengers theme as our heroes leap onto the screen for the first time. Woodwinds flutter with the strings in a few moments that definitely sound Elfman-esque. Birth of Ultron seems to teeter between a major and minor key, featuring Iron Man’s theme on piano as things shift to a more ominous sound. Ultron’s theme also makes a more full appearance here. Ultron-Twins features a plaintive cello representing Scarlet Witch among the booming effects before the dark low choir voices enter for most of the cue. Hulkbuster is a straightforward action cue, with all the Tyler-trappings and even a bold statement of the Iron Man theme. The action is loud and kept up throughout, except for an action reprieve near the end. Can You Stop This Thing? has a short burst of action and tense drama. Sacrifice is a somber track for mainly strings. The quiet moment suits Tyler and the eventual crescendo works quite nicely. Farmhouse is another relatively quiet track, with a New Avengers reference at the beginning. The acoustic guitar, piano and solo clarinet adds to the down-home feel for the most human/character-driven section of the film even if it feels completely separate from the rest of the score. The Vault is a generic action cue with some added African-style drumming and some quick string and percussion licks at the end. The Mission simmers with an electronic beat, while feeling a bit aimless. Seoul Searching picks the action up, with the brass ripping ahead. We also get a few heroic fanfare moments mixed in. Inevitability/One Good Eye brings the cello solo back with more urgency as the action starts. It’s an over the top action cue, exploring new sounds and textures in the orchestra. The Avengers theme makes two brief appearances. Ultron Wakes utilizes some interesting orchestral techniques and a hidden Avengers theme in this short cue. Vision is almost ethereal and offers some nice writing to balance the forthcoming action cues. The Battle pulls more orchestral tricks out of the bag and features cameo appearances of the Avengers theme and the Thor theme with some other standout action moments. Wish You Were Here features the pseudo love theme heard earlier in the album with a strong build to the end. The Farm reprises the tender guitar and strings heard earlier before building his New Avengers theme around the Avengers theme. Darkest of Intentions contains a lot of racing string patterns, with the low brass powering through most of it. As it relaxes near the end, the love theme appears in the strings. Fighting Back has a snippet of Iron Man built into the action cue, as well as Ultron's theme as the track charges forward. Avengers Unite brings the main statement of the New Avengers/Avengers themes with a little dose of Spider-Man-style swirling strings and choir. Shame the track is so short, but it's a great moment. Ultron's theme is featured heavily in Keys to the Past, keeping a moody and atmospheric sound throughout. Uprising is a grim track with pounding percussion and almost in Silvestri-mode near the end. Outlook combines the Tyler/Silvestri mix, with a heroic statement of the Helicarrier material. The Last One is one of the quieter tracks and uses the love theme prominently. Nothing Lasts Forever starts in a somber mood with a horn solo reprising the Iron Man theme, but the track is chock full of Silvestri and the New Avengers theme. 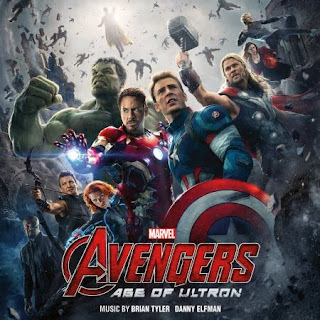 New Avengers – Avengers: Age of Ultron reprises the titular theme in the most rousing rendition on the album. In a wonderful full orchestral arrangement of the Elfman and Silvestri main themes, we send our characters off to their next Marvel Cinematic Universe film. What will the musical future of Marvel be in the coming films? For not scoring more than his Marvel films in 2011 and 2012, Silvestri is still the prominent voice with his themes appearing in 3 other MCU films. Elfman was wise to intertwine his theme with Silvestri's; both showing up at the prominent heroic moments of the film. While Tyler composed new themes for the film (love theme, Vision and Ultron), most are buried and require a few good listens to even pick them up. It is easy to identify each composer's track, especially knowing their specific tendencies. But thankfully their tracks don't clash with each other and provide a decent listening experience. Unfortunately, most of the score is pretty forgettable on album and often lost in the film mix. After all, who wants to hear music when there are almost 2 hours’ worth of CGI creations loudly fighting each other? The album is a whole other story. I'm glad to get a representation by both composers, with Tyler at 49 minutes and Elfman at 30 minutes. Two of Elfman's tracks are labeled as unused, and most seem to be in non-chronological score and aren't the film versions. Not to mention more direct quotes of Silvestri's music from The Avengers not on the album. For me, while strong and providing some good cues, it's Tyler's weakest MCU score, but I'm glad Elfman stepped in with some excellent action and non-action music for the series. Multi-film continuity is tricky with so many composers involved. I would be great to hear more Elfman, Tyler and Silvestri. But it could be worse, we could be hearing a lot more Henry Jackman on the horizon. Obviously his Avenger theme is referenced frequently in Elfman's tracks, but his Captain America theme is also very subtly stated at the outset of the 'New Avengers' track. That Silvestri-mode ending to Tyler's 'Uprising' (2:14-) is taken exactly from 'I Got a Ride' (0:05-0:20) from the original film. You already mentioned the brief statement of the intro to the Avengers theme in Tyler's 'The Battle' (2:21-2:26). It's heard throughout the original film, with its first statement in the opening track, 'Arrival' (1:06). About 2:35 into Inevitability/One Good Eye, Elfman lets loose a fantastic statement of Tyler's Iron Man theme. The only example of Elfman blatantly referencing a Tyler theme.